Gov. Doug Ducey signed a series of election reforms Monday that included measures Democrats say limit voter participation and open the doors to heavier spending to influence elections by deep-pocketed donors. The Republican-sponsored legislation addresses campaign finance, voter initiatives, third parties and political committees. Republicans said the bills solve elections-related issues such as a federal judge’s December ruling calling the state’s definition of “political committee” overly broad and vague. Democratic opponents derided the bills as a Republican attempt to tilt the scales in their favor. — House Bill 2407 by Republican Rep. David Stevens, R-Sierra Vista, modifies requirements for voter referendums and recalls, tightening rules on the signature-gathering process and the wording of the measure. Thousands of signatures can be invalidated over minor mistakes including margin spacing and serial numbers, while single signatures can be disqualified for not matching a voter’s registration or marking the wrong date. The proposal echoes a provision from a sweeping election law the Legislature repealed in 2014 after opponents collected more than 146,000 signatures in a move to put the measures before voters. — House Bill 2608 increases the number of signatures third-party candidates need to get on the ballot. It allows all candidates to gather campaign signatures from their own party, independents and parties not represented on a ballot. It also expands the signature requirements to include a minimum number of these so-called qualified voters. Critics say third-party contenders would have to collect a larger proportion of signatures than Republican and Democratic counterparts and far more than they currently need. Rep. J.D. Mesnard, R-Chandler, however, said any third-party candidate would still require far fewer signatures than either Democrats or Republicans. In backing the bill repealed last year, Mesnard said third-party candidates cost Republicans congressional seats. —House Bill 2415 increases campaign-contribution limits allowing candidates to take up to $6,250 from an individual donor per election cycle, up from $5,000. A major increase was adopted last year as well. — House Bill 2649 modifies the definition of political committee. The proposal was floated after a federal judge in December ruled Arizona’s description was unconstitutionally vague. State Elections Director Eric Spencer said he crafted the legislation to specify that groups only need register as a political committee if they are organized for the purpose of affecting elections. 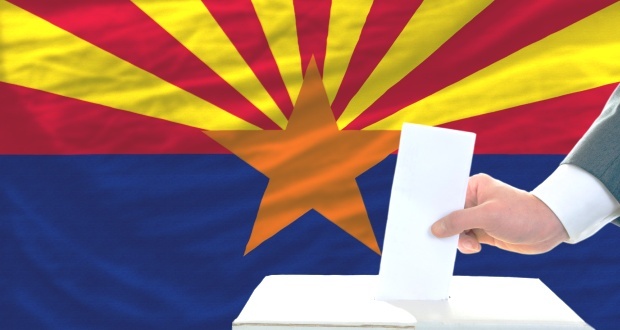 But Tom Collins, the state’s executive director of Clean Elections, said the bill would create loopholes that will allow dark money greater influence on Arizona elections. — House Bill 2613 tightens the prohibition on the use of public resources to influence a bond, budget override and other tax-related election. Backers say cities and other government bodies had taken advantage of loose language to tout their services during election cycles. Two other elections-related bills failed to make it to the governor’s desk. Senate Bill 1339 by Sen. Don Shooter, R-Yuma was designed to makes it a Class 6 felony for anyone but a family member, caregiver or candidate to collect more than two early ballots from voters during a two-year election cycle. Democratic representatives led a spirited rally against the measure beginning at nearly 1 a.m. on the final day of the Legislature. But the Senate simultaneously adjourned preventing any other bills from passing both chambers. Senate Concurrent Resolution 1001 would have sent a proposition to voters to repeal the Citizens Clean Elections Commission and give its $9 million in funding to schools. It failed in the House 29-27 on the final day of the Legislature. Just what we needed: another politician that doesn’t represent the people. Signed the Stevens bill that was promoted by lobbyist for City of Peoria. Unconstitutional & must be overturned by the Courts. Parents already furious over his veto of Common Core bills. I’ve been working on a local recall & many people stop to ask if it’s for Ducey. Sick to death of politicians who support big government.